I love a beautiful aroma of roasting besan for making any dish in my kitchen! But if I feel the same aroma at my place in India, I get strong vibes of having ‘Besan ke Laddoo’ soon :P Mum makes it every now n then for mandir-bhog n so I’m used to have it often! Heat ghee in a thick-bottomed pan and add besan + semolina in it. Roast it on low flame for 8-10 mins, continuously stirring it. It will release sweet aroma or roasting besan and start getting golden brown in color. Transfer it to another bowl and let it cool down a little. Add cardamom powder and chopped almonds along with caster sugar in it and mix everything well. Grease your plams with ghee. 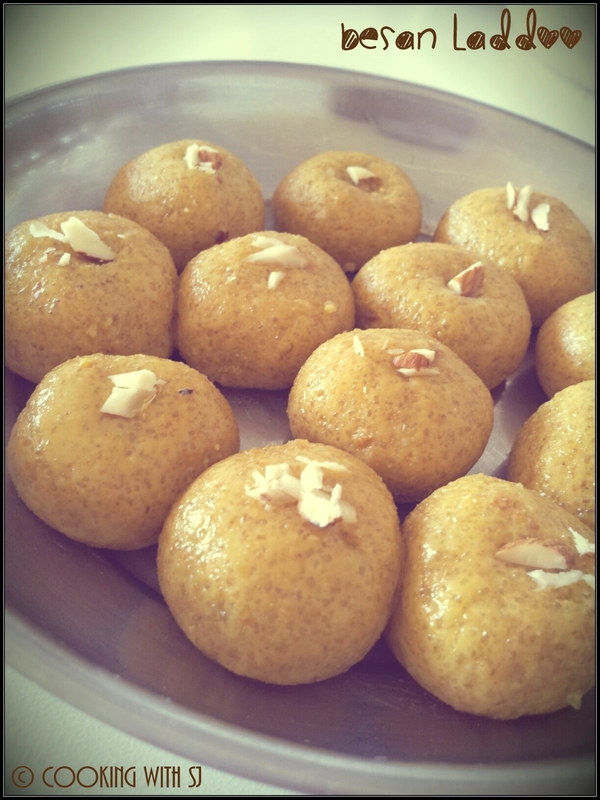 When it’s warm, start making laddoos out of it as it’s hard to bind them once they are cooled down! Take raw sugar in a plate and once you’re done making laddoos, roll them in raw sugar to cover them lightly. Let them rest for 20-25 mins and store them in air-tight container! You can also use raisins, but I take them out while eating, so I didn’t add!